Do you have photos, historical accounts or other items pertaining to the Tenney area? Would you like to share this historical information with the world? LakesnWoods.com would like to publish your Tenney photos (current or historical) or historical accounts on this website. Original materials can be returned and your privacy will be respected. 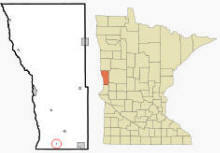 Tenney is an unincorporated community and former city in section 28 of Campbell Township, Wilkin County, Minnesota, According to the United States Census Bureau, the city has a total area of 0.02 square miles (0.05 km2), all of it land. 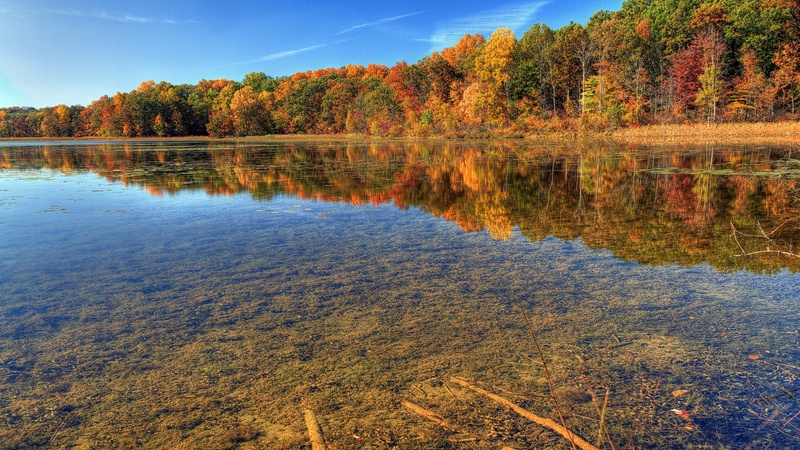 Tenney is located in the flat basin of prehistoric Lake Agassiz, a glacial lake which existed at the end of the last Ice Age. 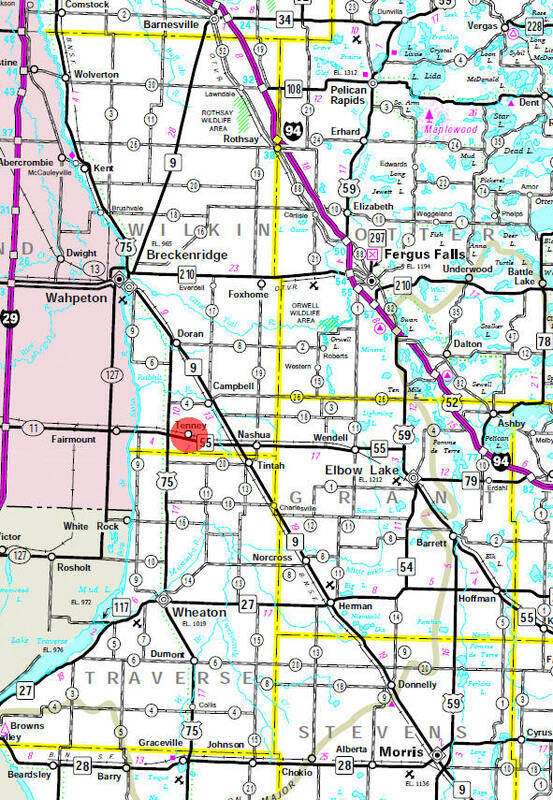 The remarkably flat land in this area is sometimes described as the upper valley of the Red River of the North, though it is not technically in the Red River valley, but is near the Bois de Sioux River. As of the census of 2010, there were 5 people, 2 households, and 2 families residing in the city. The population density was 250.0 inhabitants per square mile (96.5/km2). There were 9 housing units at an average density of 450.0 per square mile (173.7/km2). The racial makeup of the city was 100.0% White. There were 2 households out of which 100.0% were married couples living together. 0.0% of all households were made up of individuals. The average household size was 2.50 and the average family size was 2.50. The median age in the city was 56.5 years. 0.0% of residents were under the age of 18; 20% were between the ages of 18 and 24; 0.0% were from 25 to 44; 40% were from 45 to 64; and 40% were 65 years of age or older. The gender makeup of the city was 60.0% male and 40.0% female. Readers are advised to maintain perspective when reading the above paragraphs. Tenney's population is so small that it is impossible to extract or extrapolate meaningful information from the data provided. Moreover, a move or change of status by even one resident has a major effect on trends and percentages projected from the statistics contained herein. The city of Tenney was named for the owner of its townsite, lumberman John P. Tenney, because of his willingness to give land to the railroad which came through in 1885. The first house was built by his son-in-law, Fred Maechler. The post office was established in 1887, the plat was filed for record with the office of the Register of Deeds in Wilkin County on August 4, 1887, and the city was incorporated on November 30, 1901. 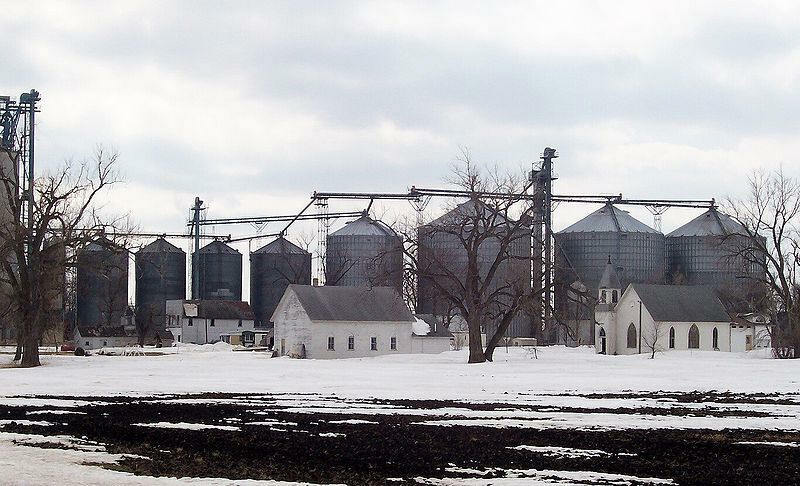 The city originally encompassed four square miles, but it never grew enough to meet its boundaries, so in 1916 the farmers petitioned their land from the city, and their request was granted. 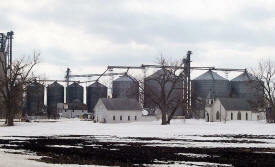 According to an unpublished town history written in the mid 1980s, the city's population peaked at about 200 in 1910. Before 1910 the city boasted a church, three grain elevators, a hardware store, two mercantile stores, a butcher shop, bank, machine shop, implement shop, blacksmith shop, pool hall, lumberyard, and a hotel, which also housed the barber shop, saloon, and post office. In 1909 a small post office building was erected and used until 1952, when Leonard Hardie became postmaster and moved the post office to the general store. Electricity arrived in Tenney in 1914, through a franchise granted to Otter Tail Power Company. After 1910 a steady population decline was driven by the lack of significant population in outlying areas, migration to larger urban centers, and the absence of dynamic economic factors to generate wealth. U.S. Census bureau data indicates that the population fell to 102 in 1920, 89 in 1930, 89 in 1940, 62 in 1950, 35 in 1960 and 24 in 1970. As local establishments burned down or went out of business they were not replaced, and finally the post office was discontinued in 1980 when the population was pegged at 19 by the census bureau. Today the only remaining business in town is the elevator. The only commercial building remaining on the main drag is the former James Bigsby general store, later the G.A. Klugman general store, which also housed the post office until its closing in 1980. The building had been vacant for several years, but was recently purchased and is being rehabilitated. The population bottomed out at 2 sometime after the 2000 census, but due to the energetic efforts of current residents, the population has again risen to six, and efforts to attract more residents are ongoing. The tiny town of Tenney is no more. 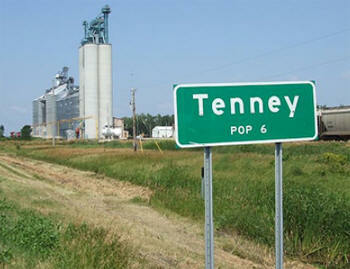 A majority of the town's voters -- there are only three of them -- have decided to dissolve Tenney, which has shared the title of Minnesota's smallest city with Funkley. The votes won't be officially counted until Wednesday but City Clerk Oscar Guenther and Mayor Kristen Schwab said Tuesday that they voted to dissolve the town. The other vote -- Guenther's sister -- was a no. "She voted that way because she knows how hard I've worked to keep the town alive,'' he said. Dissolving the city means that Campbell Township will take over the city's two buildings -- a church that was renovated into City Hall and another church renovated into a community center -- along with four vacant lots, Guenther said. He'd like to keep the two mowers and a weed whip to maintain the lots, but Schwab said that's unlikely. At the turn of the century, in a small railroad town built in the agricultural boom of the Red River Valley, the women of Tenney, Minnesota had their own stories to tell. In The Tenney Quilt, Haagenson gives voice to women whose only means of chronicling their lives and histories were a needle and thread. 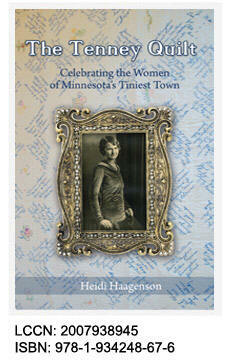 The Tenney Quilt is a tender and enlightening rendering of small-town life for the Midwestern woman in 1928. Haagenson pieces together this deeply personal account of the men and women of Tenney around an heirloom quilt with a history of its own. In 1928, Tenney's Town Hall sought funds for a cook stove in order to accommodate the social events and gathering of the town's residents. Several women initiated a project to raise the money: a signature quilt would be made, ten cents collected for each signature and piece of the quilt added to the whole. What ensued was a gathering together of 530 people, their lives, their values, and a preservation of these documented in a hand crafted chronicle of Tenney history. Haagenson uses the quilt to highlight the disparate lives of German, Scottish, and Norwegian immigrants working as school teachers, storekeepers, homemakers, nurses, factory workers, and seamstresses and how they come together to share their time and talents for their community. Chapter by chapter, thoughtful commentary on the limitations placed on these women due to time and place is interspersed between accounts of the women's honest and willful commitment to their families and each other. Schoolyard reminiscings, familiar rituals such as church socials, and exciting historical "firsts" offer light to the hardships of daily life in home and vocation. "Today we are in the midst of an explosion of interest in women’s history, and historians, traditionally attracted to the written word as a way of understanding the past, are increasingly recognizing the need to turn to other sources as well, since women, who were often denied education and discouraged from writing, left fewer records than men. One source, and a paramount one, is their quilts. For if comparatively few women wrote, practically all of them sewed, and in their quilts, especially, they found a capacious medium for expression. For vast numbers of women, their needles became their pens, and quilts their eminently expressive texts. "